Now that's a redundant title. If it's "history" it must be "past"! Anyhow...here's something I found when packing up my books and office "stuff". 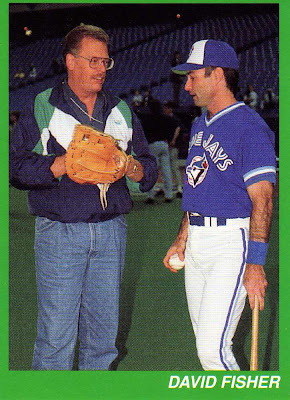 Do I really think that I can show Paul Molitor (now in the Baseball Hall of Fame) how to catch a ball? Over the years I must have signed and given away 2,000 of these cards. Do you want one? Did you check e-Bay? Don't! You won't find it! Dear David...This is a real good testimony story. I found that it was too small to read so I just clicked on the writing and it is large enough and easy to read. 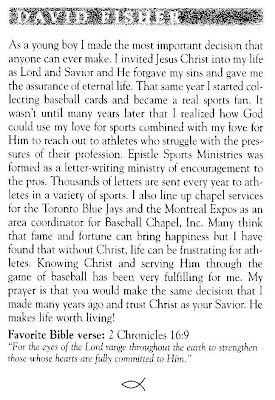 Nice card, and excellent testimony. Do you miss being there with the Blue Jays? Honestly, I never liked the team because I liked the Expos...I used to listen to 'spos games falling asleep. Baseball may be boring, but it sure is great to fall asleep to! Now I just listen to the World Series, though...just like I listen to the Super Bowl, yet hate the NFL. Oh well, I might have to like football if my friend's nephew makes it big...he's already played for Team Canada at the World JR Football Championship! My sister keeps saying to remind you that Hockey season might be over, but the CFL season just began...whatever. I only follow the CFL when it comes to the Play-offs! I think Hockey is the only sport I always follow, but I think I'll give it up if I ever follow my dream and move to the Southern US to care for my ailing grandma full time.